Political Resident A senior ranking political representative (equivalent to a Consul General) from the diplomatic corps of the Government of India or one of its subordinate provincial governments, in charge of a Political Residency. in Qie Persian Gulf Historically used by the British to refer to the sea area between the Arabian Peninsula and Iran. 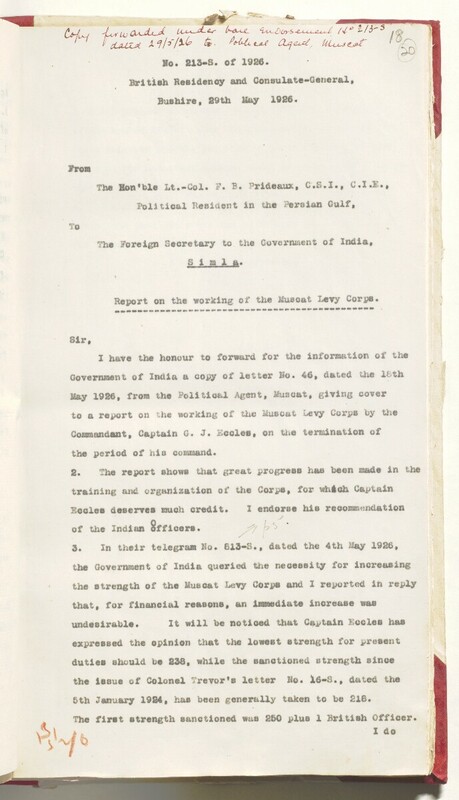 Often referred to as The Gulf or the Arabian Gulf. .
Report on the working of the Muscat Levy Corps. the period of his comand. of the Indian §ffi cers. &th January 19S4, has been generally taken to be 218. The first strength sanctioned wus 250 plus 1 British Officer.